The Royal Automobile Club has announced the nominees for the coveted 2018 Torrens Trophy award, which will be presented at an exclusive ceremony at the club’s Pall Mall venue next year. The Torrens Trophy is a prestigious award recognises an individual or organisation considered to have made an outstanding contribution to the cause of safe and skilful motorcycling in the United Kingdom, or to have made an outstanding contribution of technical excellence to further the cause of motorcycling in the UK, or to have shown outstanding skill in international motorcycling sporting events in the United Kingdom. It was first awarded in 1978 in memory of Arther Bourne, a motorcycling journalist who wrote a column under the name Torrens. World Superbike Jonathan Rea was awarded the coveted trophy in 2017 after becoming the first rider in history to win three back-to-back superbike crowns. Other victors include Ian Hutchinson, Shane Byrne and Tom Sykes. 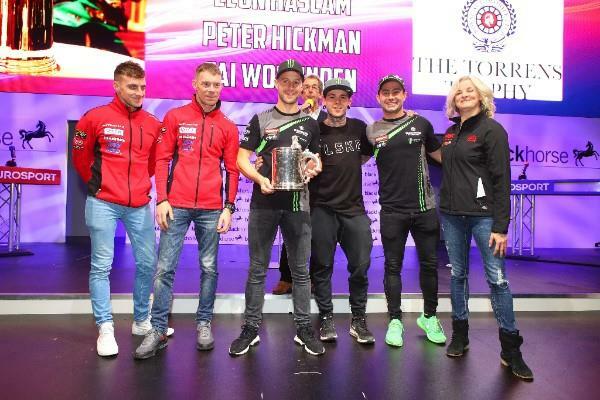 Rea’s 2019 team-mate Leon Haslam appears on the list of nominees after he fought back from a disastrous 2017 British Superbike campaign to dominate the 2018 season and take the title. World Speedway champion for the third time in 2018, Tai Woffinden also makes the list of nominees after overcoming the pain of breaking his foot in Heat 11 to win the final Grand Prix of the season in Poland. Winner of the 2018 Senior TT having shattered the Isle of Man mountain course’s lap record with a 135.452mph lap, Peter Hickman is another contender, while fellow TT stars Ben and Tom Birchall have also been recognised after their double World Sidecar title as well as their five consecutive TT wins. The Torrens Trophy Nominations Committee will now decide who shall win the award, which will be presented in early 2019. The committee consists of ex-bike racer Barrie Baxter, RAC chairman Ben Cussons, respected motorcycle journalist and MCN contributer, Mat Oxley, commentator and former Grand Prix racer, Steve Parrish, son of Arther Bourne, Richard, and Maria Costello MBE.